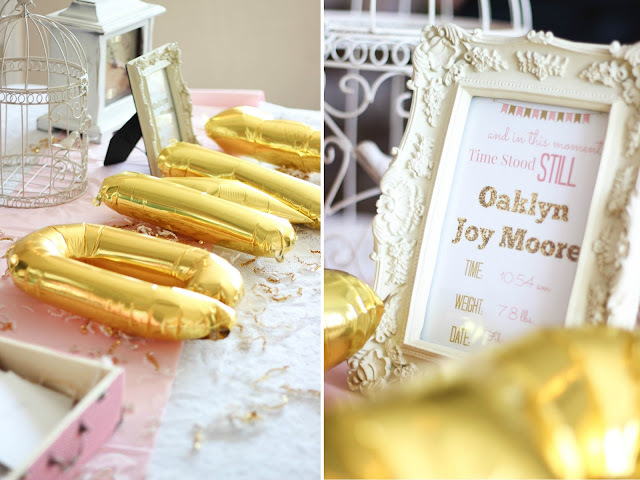 Oaklyn Joy's First Birthday Party | For the Joy of Life. 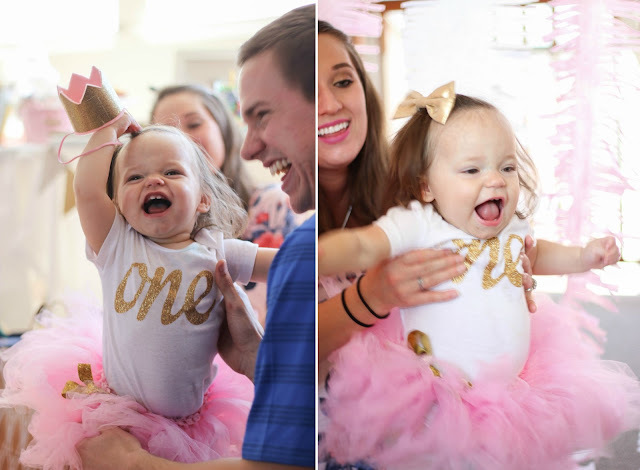 Oaklyn Joy's 1st birthday party was on February 20th, 2016 and it turned out to be just about everything I had dreamed up for MONTHS! 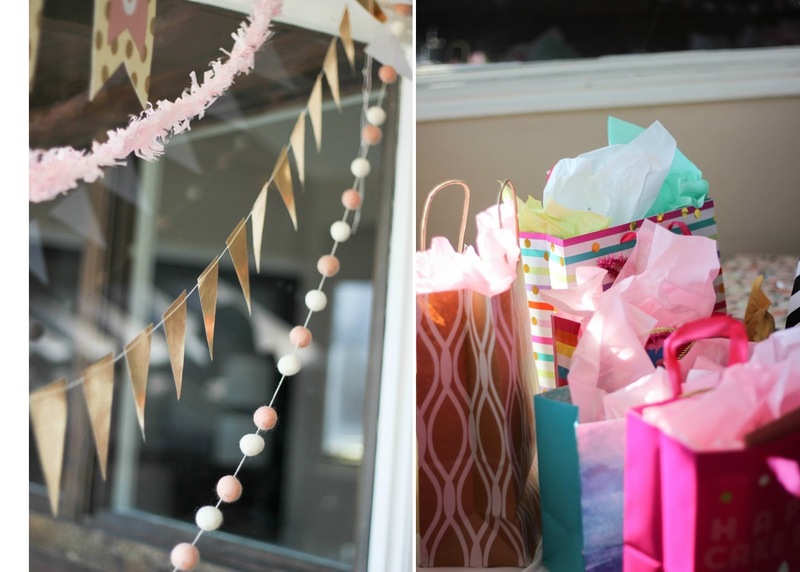 There was some serious prep involved with this party but I'm so glad I stayed up many nights til around 1 am crafting because I'll remember this party for years to come. 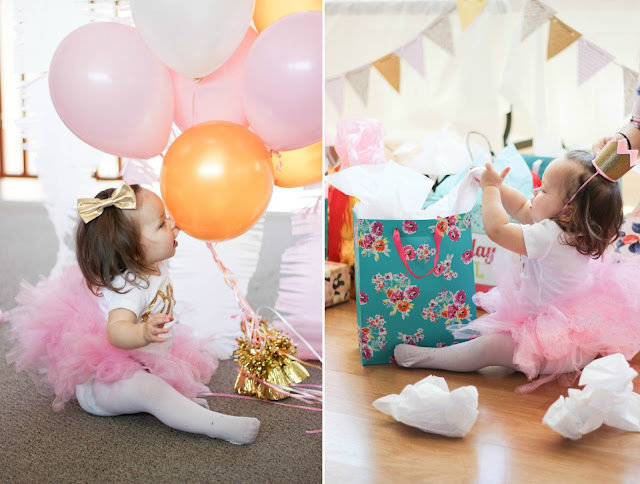 I cried the night before the party because I just couldn't believe how quickly the time had flown by. The only thing keeping me from breaking down the day of was how incredibly busy we were putting it all together. I'm gonna overload you all with a ton of information and photos in a moment, but first and foremost, I feel it appropriate to thank a few people. 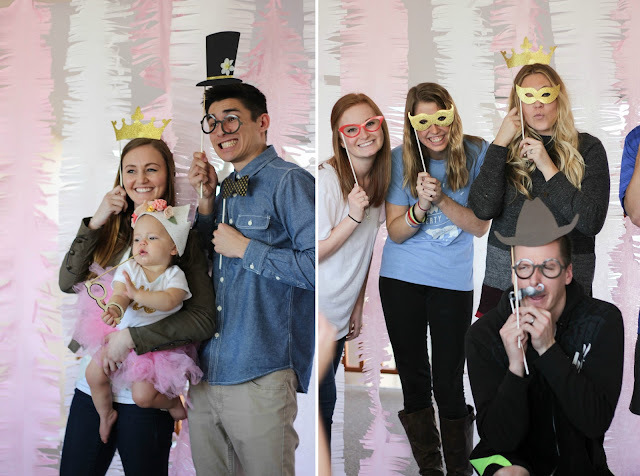 To the grandparents: I really can't say thank you enough for flying in just for Oaklyn's party! 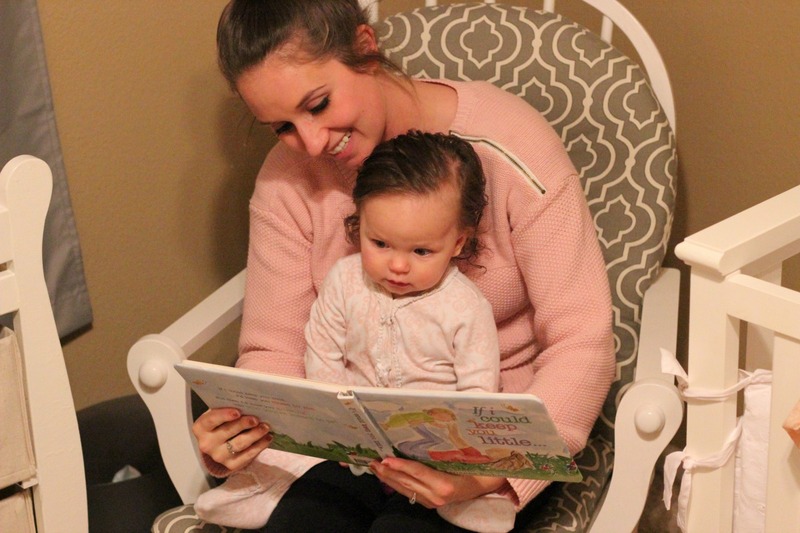 It really meant the world to our little family. 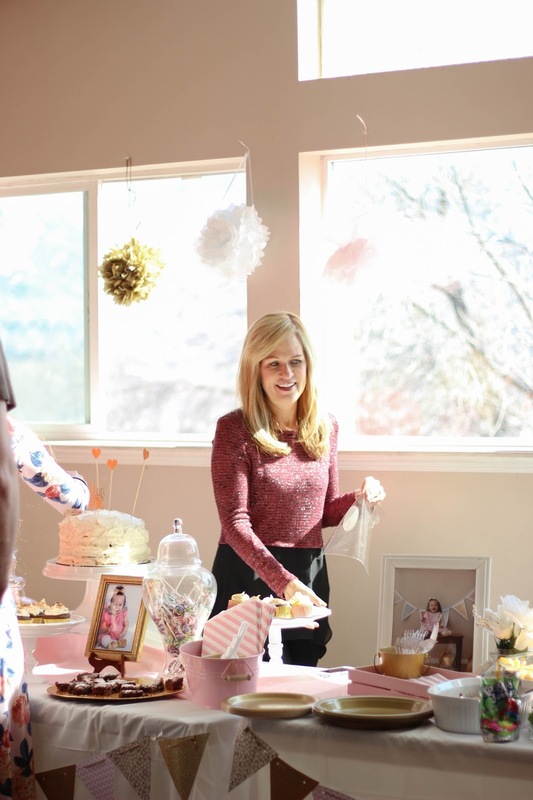 Thank you for showing your endless love to our little girl and for helping so much with the party! To the friends and family that came: Thanks for coming and for spoiling our little girl! She loved her presents! Also, thank you for staying after to help clean up! What guests do that?? 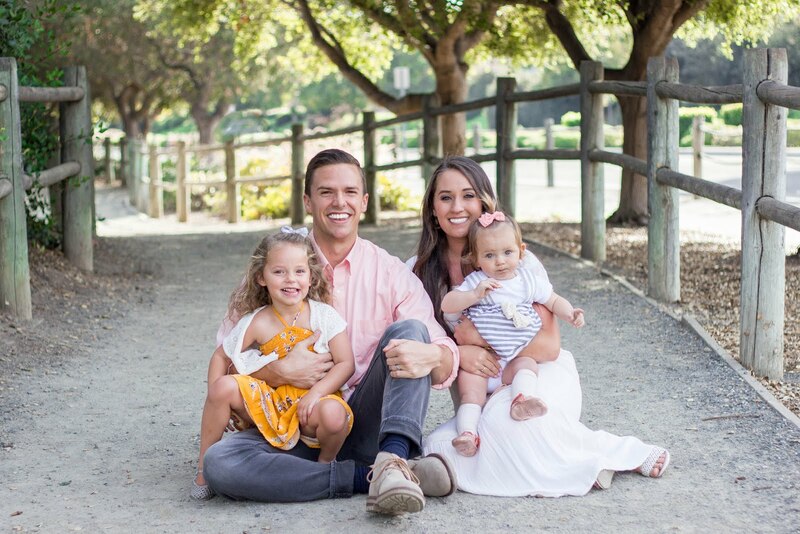 We have the best friends and family around! And to the vendors:You guys are the greatest! Thank you for completely exceeding my expectations and for going above and beyond to help make Oaklyn's party exactly what I had hoped it would be! Okay now let's get to it! First things first, I knew I had to find a venue. I thought about doing it in our tiny condo but knew it wouldn't comfortably fit the people I wanted to invite. Luckily, our complex has a clubhouse with a big open room that worked with what I envisioned. I booked it about three months in advance and asked for a pretty big time window the day of to ensure a private party. Unfortunately our clubhouse doesn't allow you to bring anything in the night before for liability issues so we literally set everything up the day of. Craziness. The next thing I did was hop on pinterest and I searched "Gold and pink first birthday." I found quite a few great parties and was feeling extra inspired, so I got out a pen and paper and wrote down everything I wanted and everything my mind began to dream up. I planned each wall according to backdrop and each table with each backdrop. 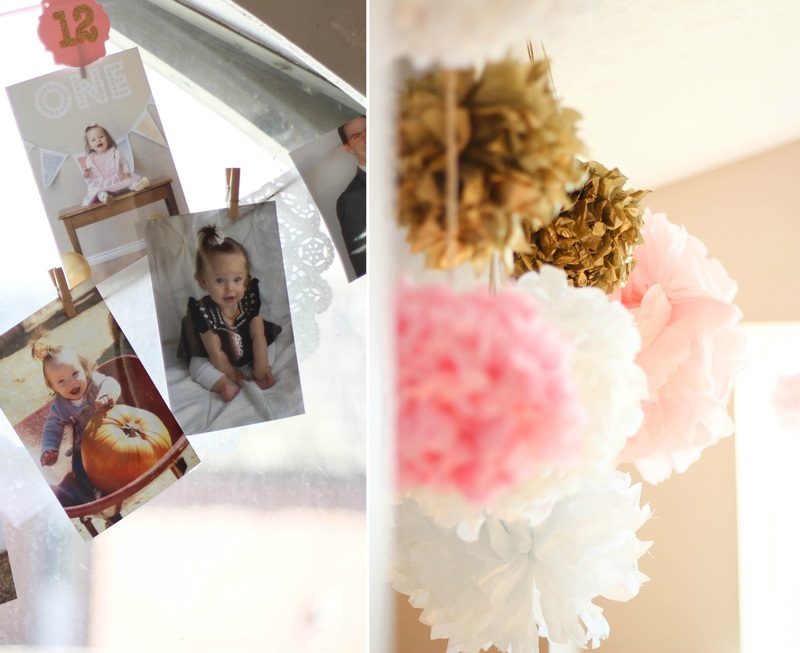 From there, it was time to purchase decor and make invitations! 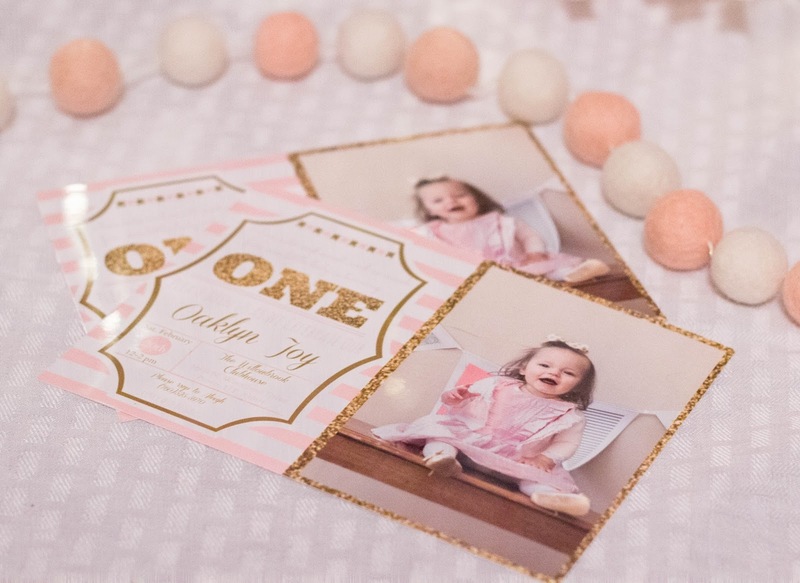 About two months in advance I started to design Oaklyn's invite. I knew the color scheme would be pink, cream, and gold with a whole lot of sparkles so that's exactly what I went with! I used photoshop to design the invites and just played around until I loved it. They read "She's cute and sweet and so much fun, our little lady is turning one!" Then had all the info necessary... From there, I designed the prints that I needed to display around the party. 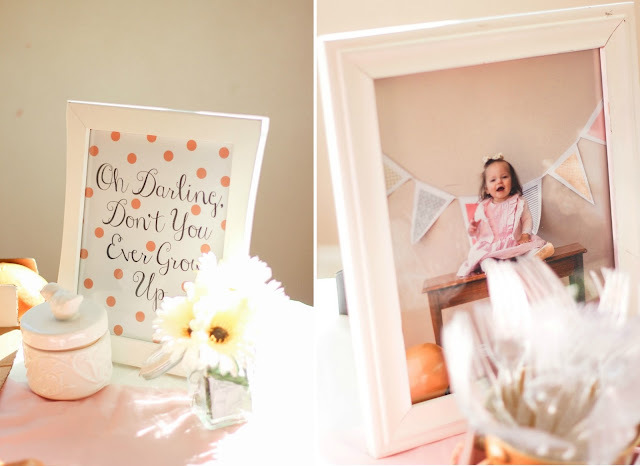 I made one for the photobooth, one for the time capsule, and 2 cute ones to display in frames. I am usually a fan of printing on card stock but it didn't agree with my budget so we printed everything at Costco and I still loved the way they turned out. So I knew what I wanted the party to look like at this point, but another huge factor to consider is food. I thought about just doing snacks and treats but to be honest, I can't stand when I go to a party and there's just snacks and treats. Oops, sorry 'bout it! I included that lunch would be served on the invite, so lunch was served! I tried my best to find something everyone would like. I decided sandwiches are a safe bet and did some pricing. Most sandwich shops are ridiculously overpriced when it comes to catering. I had a lead from a friend that told me anywhere with a deli does catering. Ah! Genius! I went to two grocery stores, Target, and Walmart. Walmart gives you the most bang for your buck by far! I ordered the 6 foot deli sandwich that already had meat and cheese on it and came with lettuce, tomato, onion, mayo, and mustard on the side. The only reason it is cheaper is because it doesn't come pre- cut but for $60 cheaper than Subway... I'll take it! I also made some boxed mac n cheese for the kiddos, pasta salad for the adults, a veggie platter, and we had chips with guac and salsa for snacking! 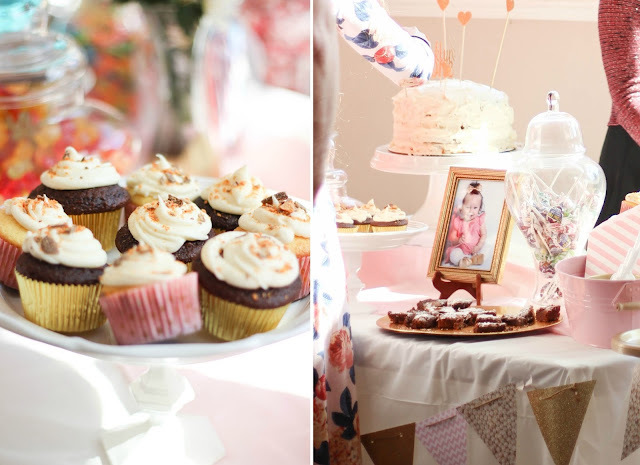 I have a love for a good sweets bar! 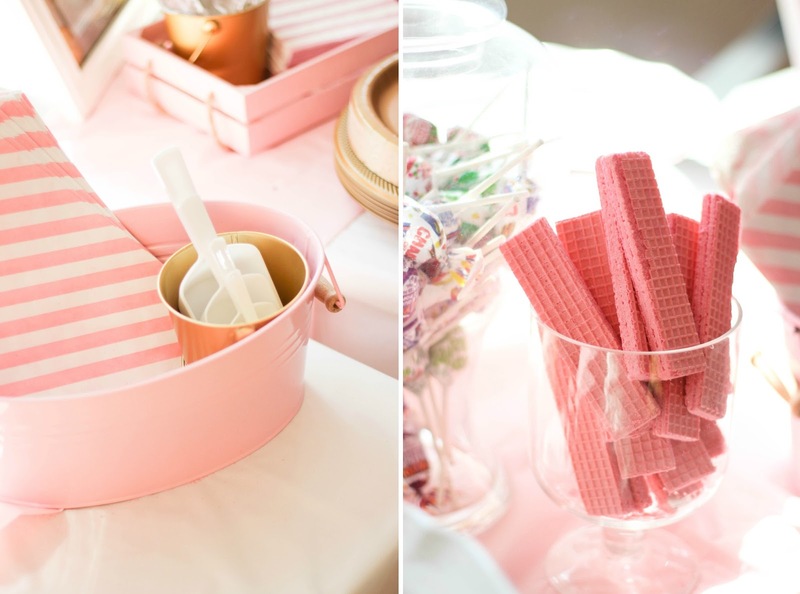 We had a candy bar at our wedding reception and it was a huge hit! My mom is also kind of the queen when it comes to candy bars so I knew I could count on her to set it up. Most of the candy was surprisingly from the dollar store! I had 3 apothecary jars already and made three more on my own! You just need to find large vases from a thrift store and smaller dishes that will work as lids. Use marbles, shot glasses, or tiny dishes as the handles. I used Loctite glass glue from ace hardware to make sure it would all stay together and it worked great! The jars were filled with gummy worms, lollipops, smarties, gummy bears, pixie sticks, and sugar wafers and I just love how it looked! I also wanted other treats for the non-candy lovers so I made chocolate and vanilla cupcakes assorted with chocolate and vanilla frosting. Some had butterfinger bits and others had pink sprinkles. I got the gold and pink and white polka dot liners from pebbles in my pocket. 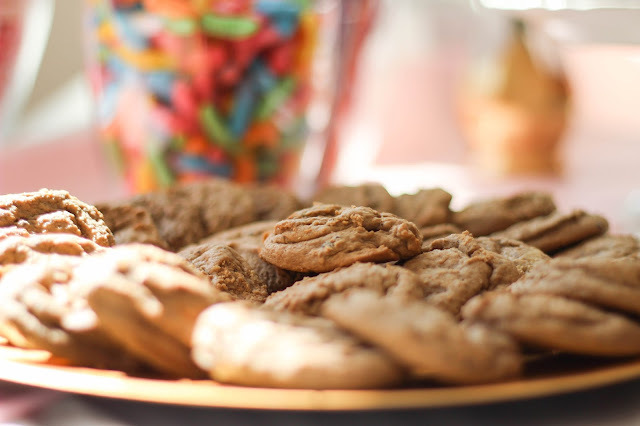 There were also brownies and cookies and cream cookies! To display these assorted sweets I used gold chargers for some and white diy cake stands for the others. I found glass candlesticks and white plates from a thrift store and washed them really well. I then placed the candlestick in the middle of the bottom of the plate and used the loctite glue to stick them together. I then spray painted the whole thing white and it costed me about $3 to make 4 cake stands! 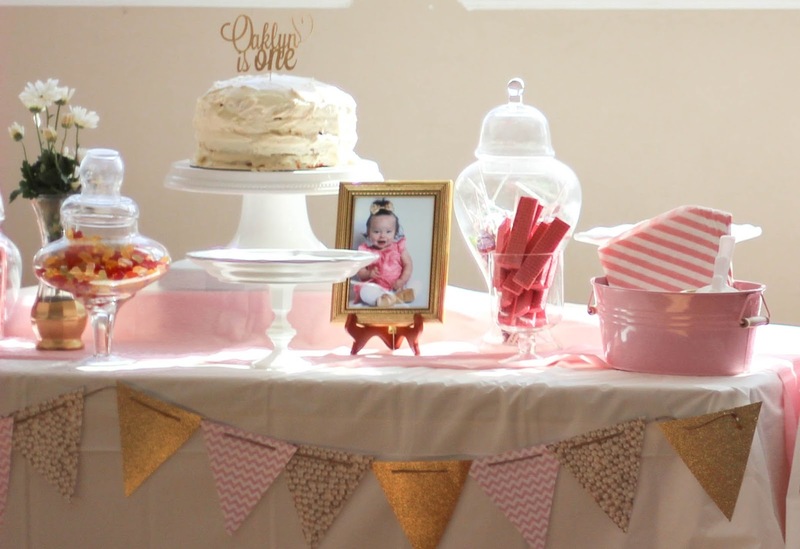 Oaklyn's cake was funfetti with homemade vanilla frosting and wasn't quite frosted the way I had envisioned but ya know time crunch... everything can't go as planned ;) haha We put her cake on a bigger white cake stand and put a shoe box underneath the tablecloth to raise it up. 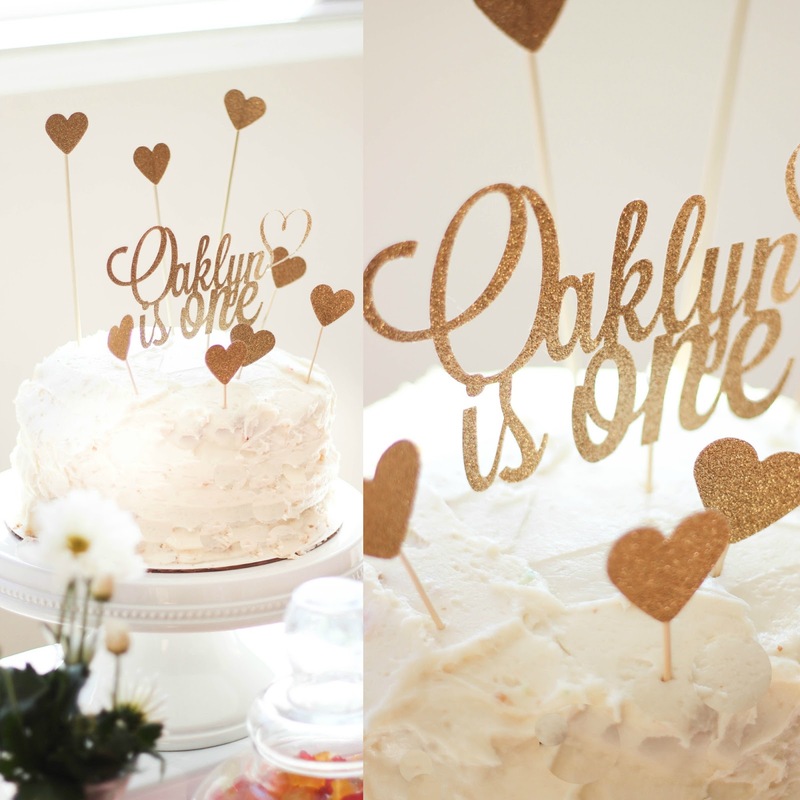 The cake topper was my absolute favorite part of the sweets table! 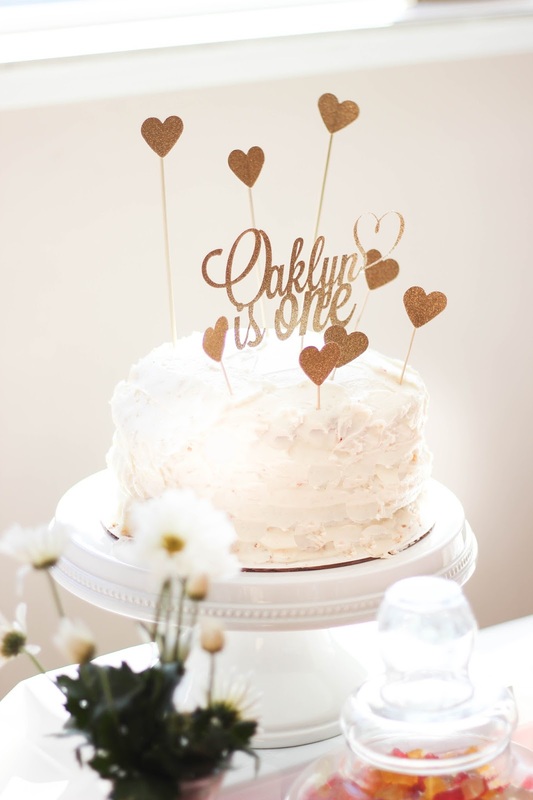 The custom cake topper is from Rustic Daisy Designs and it sure is gorgeous! The paper pink and white striped treat bags are from Zurchers as well as the candy scoops, pink and white striped napkins, clear silverware, and gold plates. I got super lucky and scored the holders for all of this from Target in the dollar section! Their spring collection had so many different cute pink bins! I kept the centerpieces pretty simple and tried to work with things we already had to cut costs wherever I could. I was really happy with the way they turned out even with the simplicity! I used white plastic tablecloths from Zurchers on each table. I got several different patterned fabric rectangles from Hobby Lobby for about 50 cents each and placed them in the center of the table. 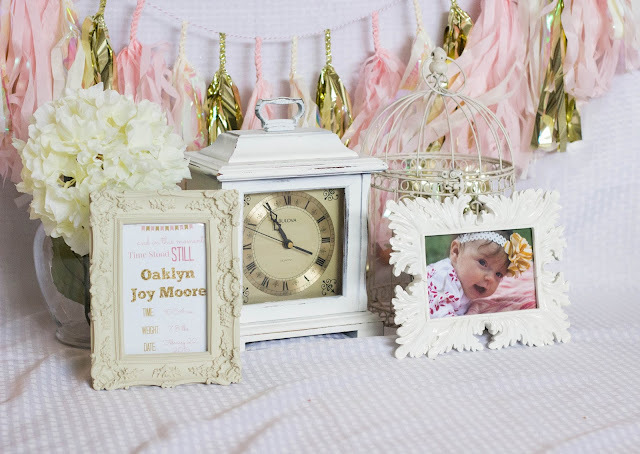 I collected 6 white frames from around the house and displayed 6 of my favorite photos of Oaklyn in them. I then went to our local thrift store and found several glass vases of all different shapes and sizes. I brought them home and spray painted them gold. I put painters tape where I wanted the vase to sill just look like glass. The day of I bought some fresh daisies from Walmart and put a few in each vase. 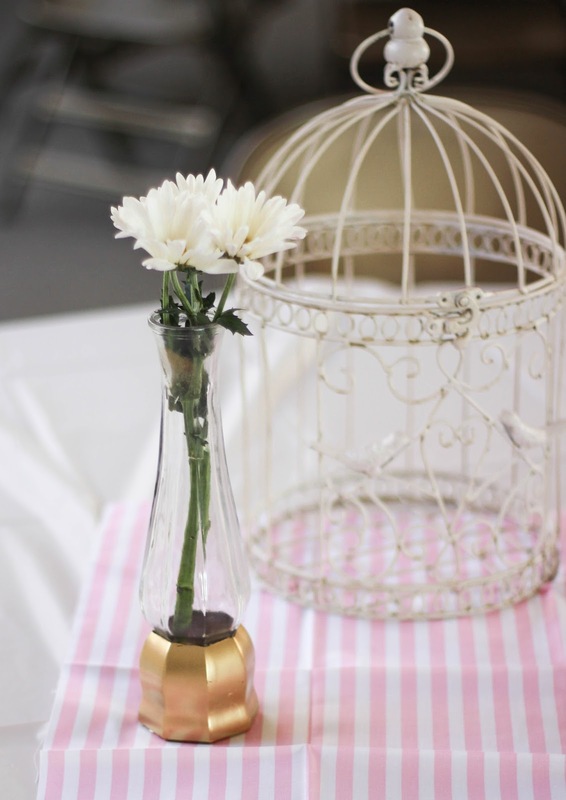 I also put a bird cage on each table because I love bird cages. I already had about 8 of them from our wedding and just reused them. They are from Michaels. The tables were placed in the center of the venue making it easy to see all the action. 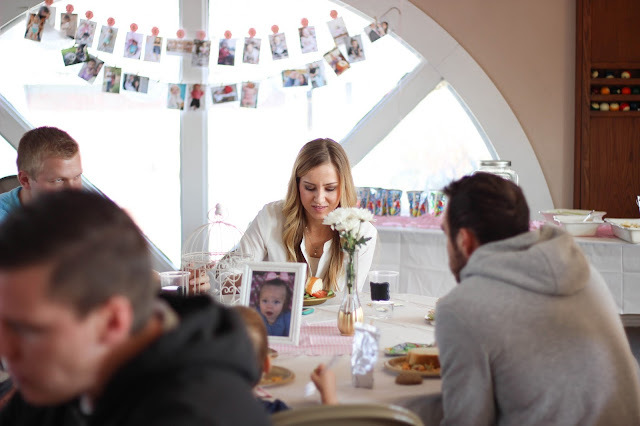 Raise your hand if you've ever walked into a party and felt completely awkward because none of your friends are there yet, the host is nowhere to be found, and you're just not quite sure what to do. Hi, I'm raising my hand... The Alison Show (world's best party thrower) has said that there always needs to be something for your guests to do right as they walk in to alleviate that "awkwardness." So, I created somewhat of a sign in table. 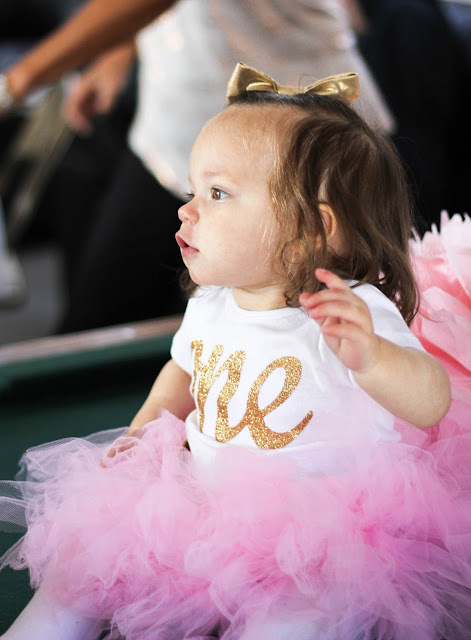 I knew Oaklyn wouldn't actually remember this party, but I still wanted her to be able to look back on it and smile. 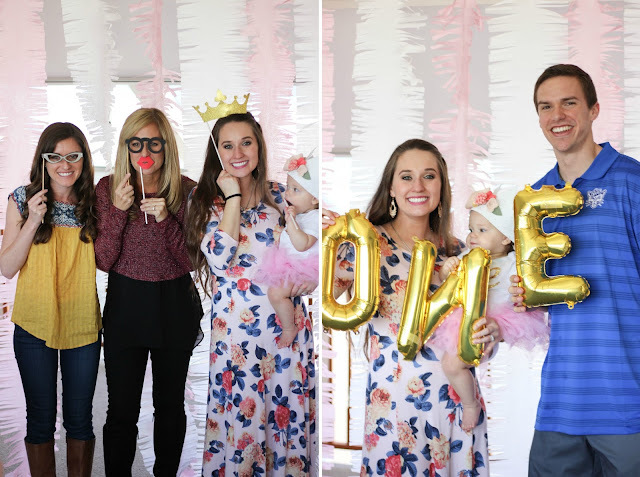 I of course wanted there to be tons of pictures for her to see, but I wanted to involve the guests. I thought about making a book of pictures of her to sign but that felt so wedding-ish. I thought about doing Polaroid pictures of each guest but I didn't have a Polaroid camera. Then I thought of doing a time capsule! There was a table right as you walk in with the time capsule displayed. I made a print that read: "To be opened when Oaklyn turns 18... Stop here you see, and write a very special message to me! 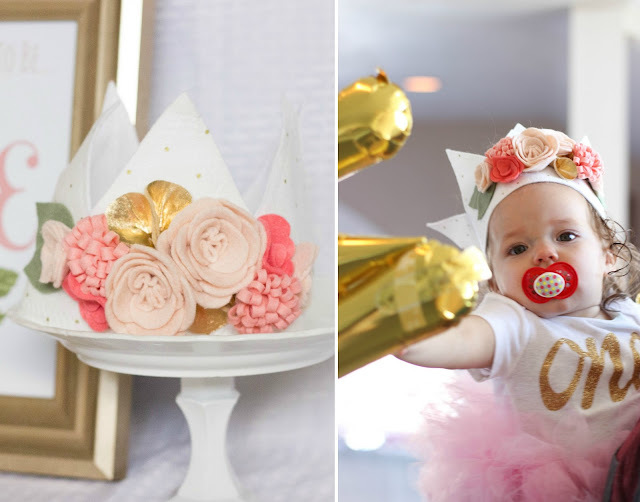 A wish or memory, just give it a whirl... for your very favorite, ONE year old girl! Don't forget to sign your name!" I had a pen and some blank white cards for people to write in. There was also a pink box to put them in once they were written. The box and all the pictures from the party are now tucked away in her closet for her to open when she turns 18. On the other side of the table I had a clock set to her birth time with a print in a frame that said: "And in this moment time stood still." It also had her birth stats such as weight, time, and date. We just used a pink tablecloth from zurchers folded in half as the table runner. 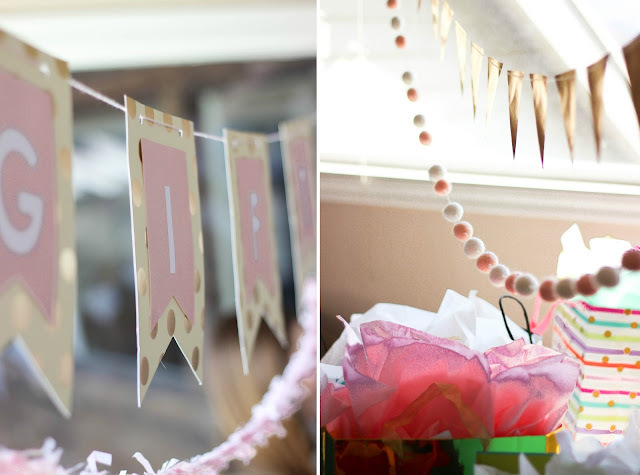 There was an adorable tissue tassle banner from My Paper Crush hanging on the edge of the table and it tied the decor in perfectly! She has the best quality tassles I have found! 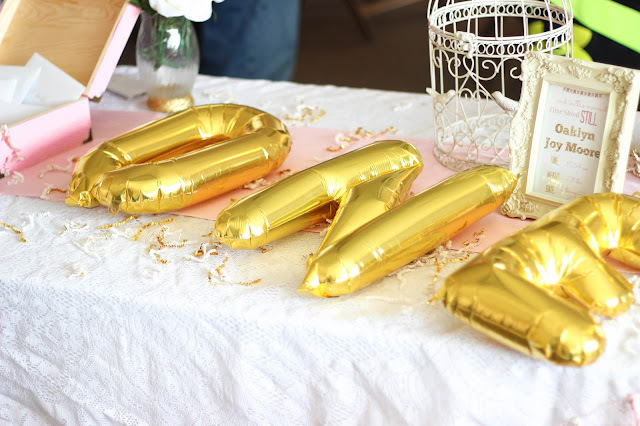 The gold confetti sprinkled on the table as well as the adorable gold letter balloons are from zurchers also. 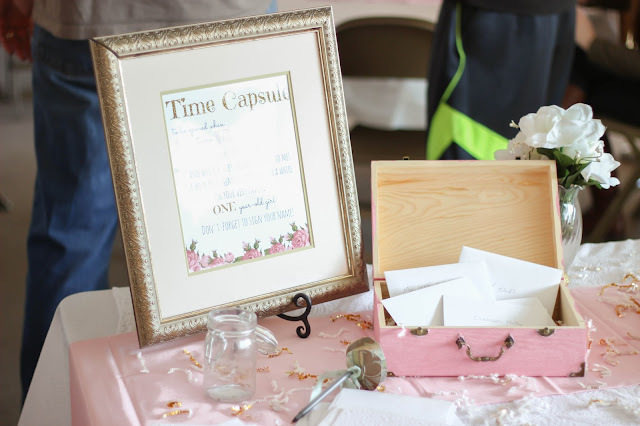 To the right of the sign in table was the gift table. We just used a round table with a white tablecloth from zurchers because it was just going to get covered in presents anyways. I love garlands of all sorts, shapes, and sizes. Love, love, love them! I was so excited when My Paper Crush sent me the cute mini gold pennant banner and from there the gift table came to life. I made the "Gifts" banner myself out of paper from Pebbles in My Pocket. 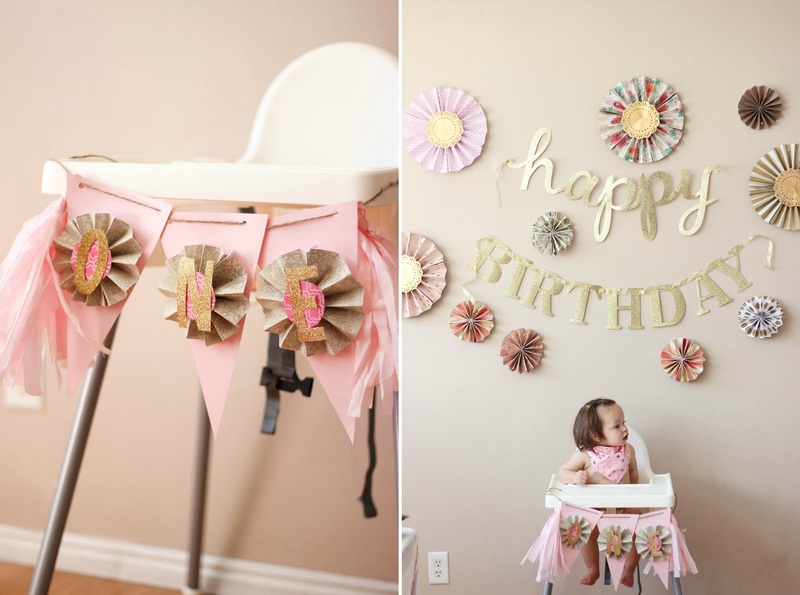 The super cute felt ball garland was from there as well. They sell the cheapest felt balls I have found! If you haven't found a love for felt balls yet, you need to. 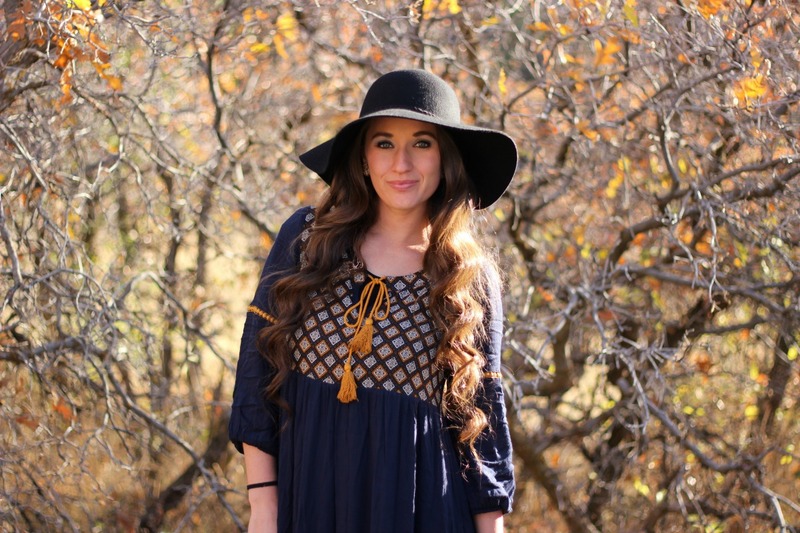 They are darling, come in all sorts of colors and sizes, and work for any occasion. They're pretty much a pain and a half to string but so worth it in the end! The pink festooning is from Zurchers and I just love the stuff! It's frilly and adorable. This wall was hands down my favorite. It actually didn't go as planned, but I like the way it turned out better than the original plan in my head! 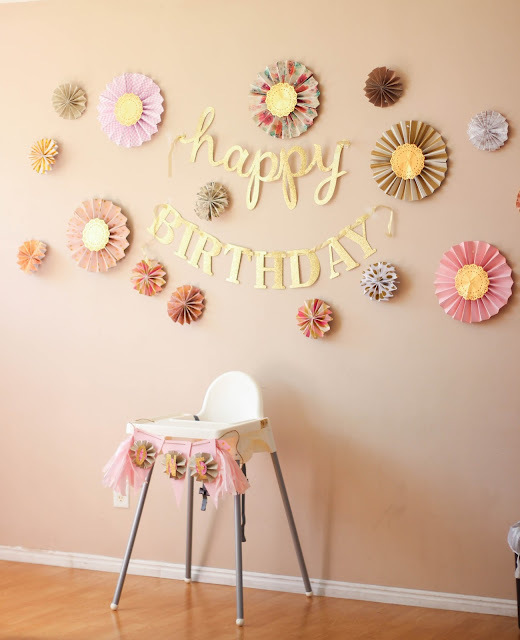 The "Happy Birthday" banner is from Hobby Lobby in their party section. I hand made every single one of those paper pinwheels and love them so much! They were a bit time consuming but so worth it for the end result. I got all of the cute scrapbook paper from Pebbles in My Pocket. They have the best selection of scrapbook paper, hands down! To make the large pinwheels you need three sheets of paper. You fold the paper accordion style then fold it in half. Hot glue it together once it is in half. Do that to all three sheets of paper and hot glue all the sides together and Ta-Da! Complete! I used gold doilies from Pebbles in My Pocket for the middle. The mini pinwheels just need one sheet of paper. After folding accordion style, you fold the paper in half but instead of gluing together you cut at the fold. Then fold each half, in half and glue the ends together. 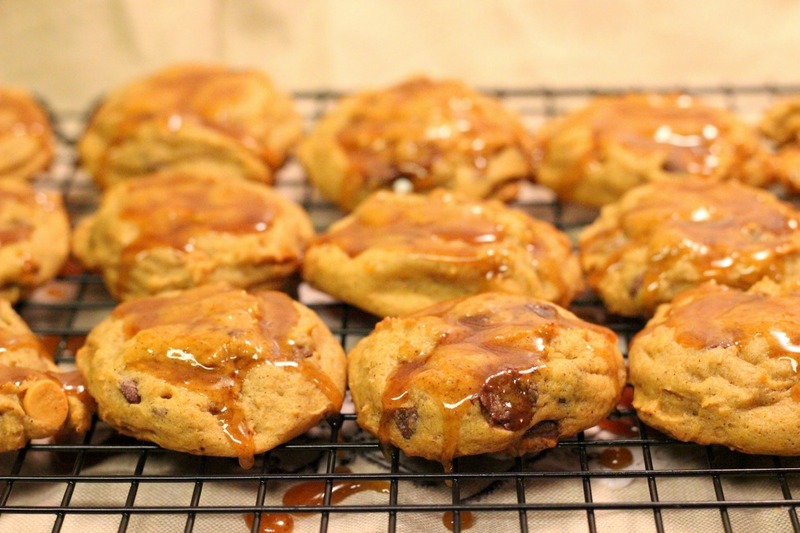 I realize that may not have made any sense at all... Maybe I'll just do a separate blog post tutorial for them! I made the highchair banner using scrapbook paper from Hobby Lobby and strung it through twine. 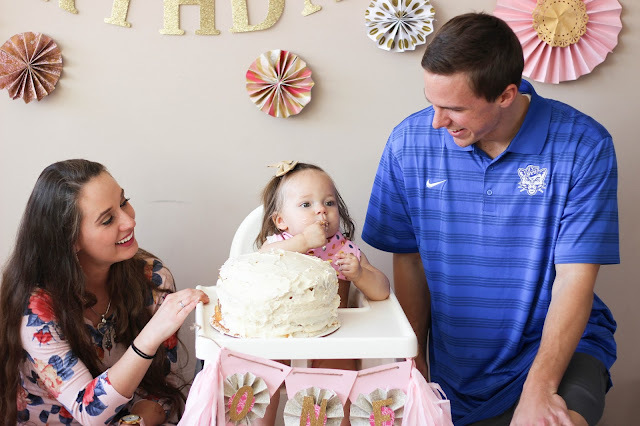 Oaklyn was surprisingly much more dainty with her cake than we had thought she would be. 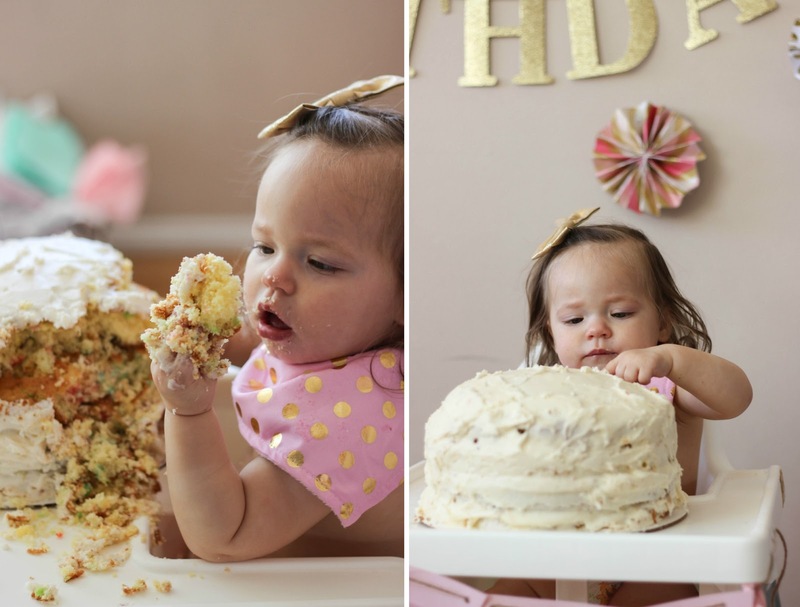 I think she already had her fill of sweets before the cake smash even happened haha. However, once she figured out she didn't actually have to eat it but rather could just play in it, she got super messy! 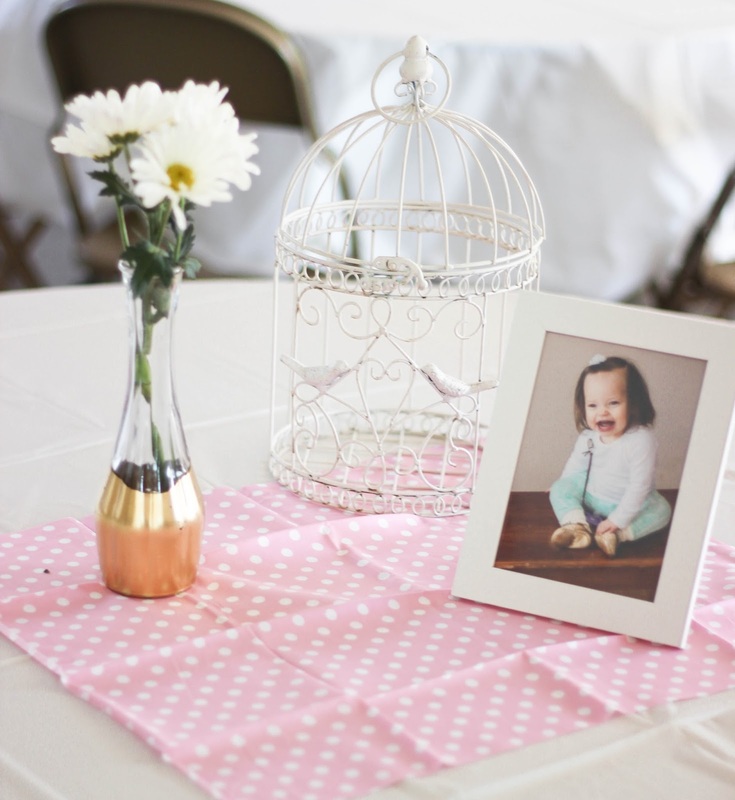 *Tip: put a plastic tablecloth underneath the high chair to make for a much easier clean up! I have this idea in my head that every single party, no matter how big or small, needs to have a photo booth and a hashtag. Usually guests feel somewhat awkward asking to take a picture in the middle of a party, the husband doesn't want to, or there's just never a right moment. 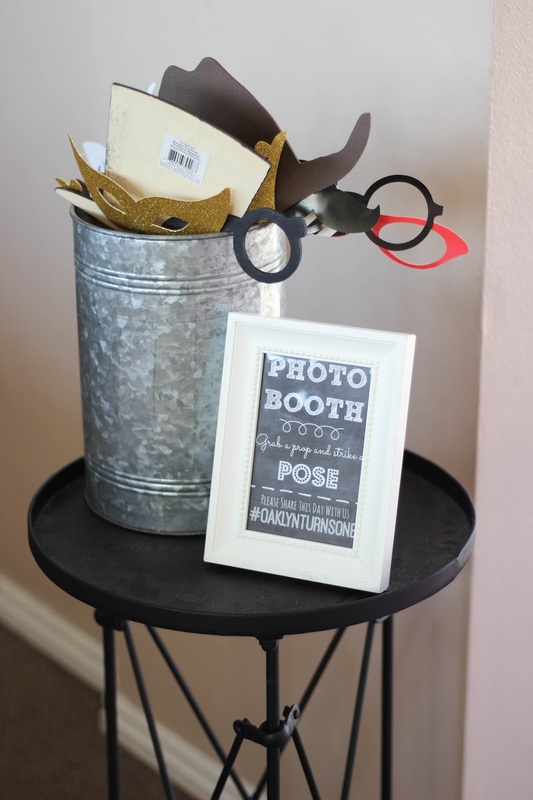 If you have a photo booth all ready, guests feel much more inclined and a whole lot less awkward, about taking photos. I had some props already from our wedding but the others were from Hobby Lobby. I made the print to go next to the props with the party hashtag so all guests knew to use that hashtag. If you create your own hashtag you will get to see everyone else's posts about the party and include those photos in the scrapbook later. Or at least, that's the goal! The backdrop was made out of crepe paper sheets from Zurchers. My mom cut the fringe on each sheet and we hung them from the ceiling with scotch tape. Each table had a white plastic tablecloth from Zurchers for easy cleanup. 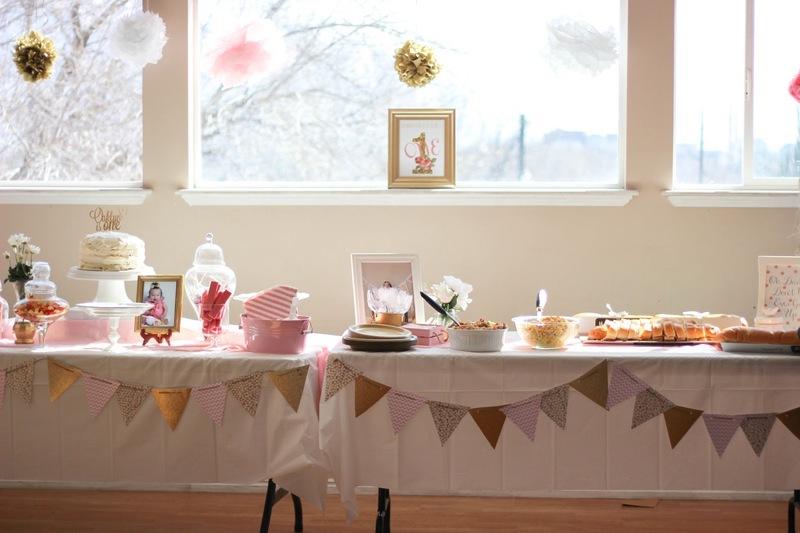 Zurchers has an incredible variety of different colored tablecloths to choose from and they hold together well! 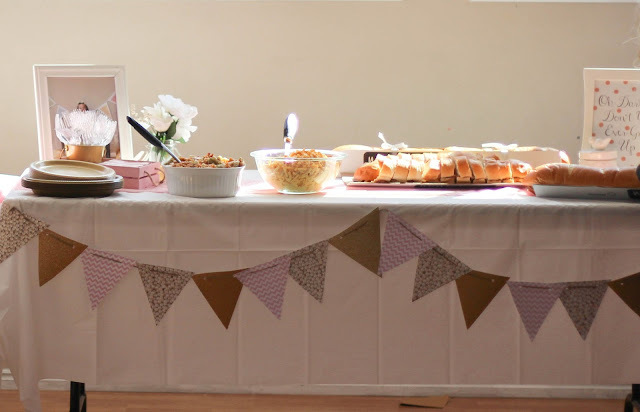 I also got a few light pink plastic tablecloths from Zurchers to use as a runner on all of the rectangle tables. This is a cheap and easy hack! You just fold the tablecloth in half and cut it at the fold and you have two runners ready to go! I made a few pennant banners for the food tables because as I mentioned earlier, I just love banners! 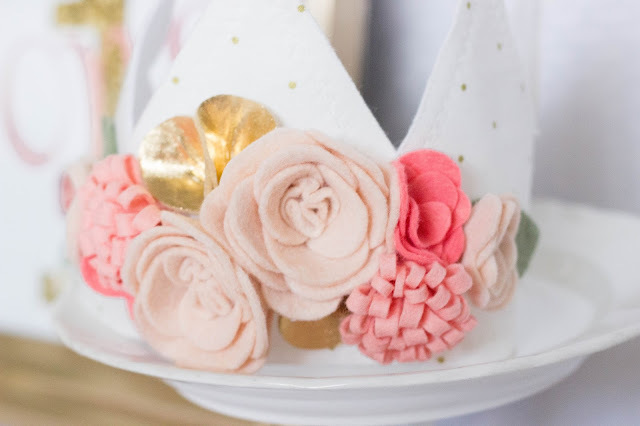 They are so easy to make out of scrapbook paper. 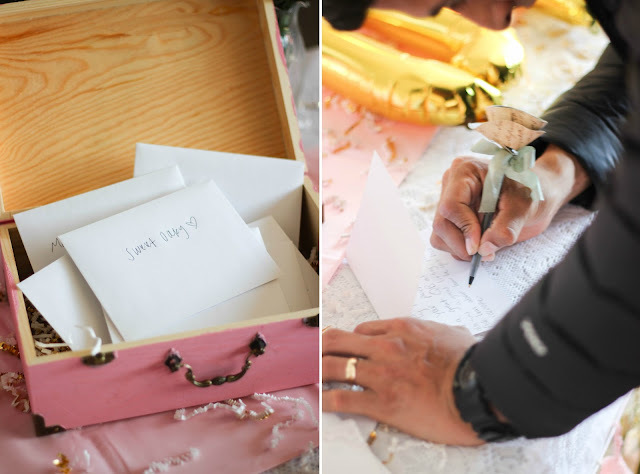 Just choose your shape, cut, hole punch the top, and string through ribbon or twine. 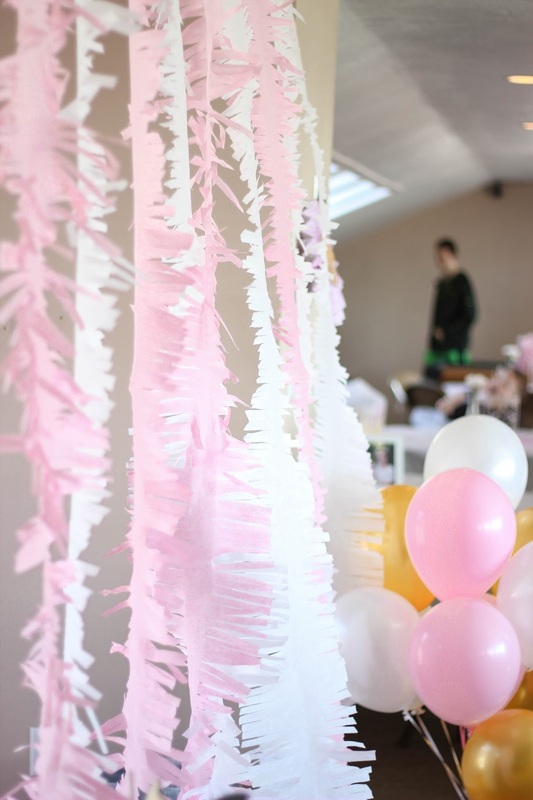 I made a ridiculous amount of tissue paper balls to have hanging above the food table only to find that the ceiling was much too high for any of us to reach. If we wouldn't have been totally running out of time, I would've made it work... but instead we hung them around the party. These things are SO time consuming and it might just be worth it to spend the extra money and get the pre-made ones... but hey cheaper is always better to me ;) If you know me in real life, you'll know that I am obsessed with taking pictures. We have more pictures from Oaklyn's first year of life than most parents have of their child's whole life ha! I made sure to take a picture of Oaklyn every single month and knew I wanted to display them somehow. 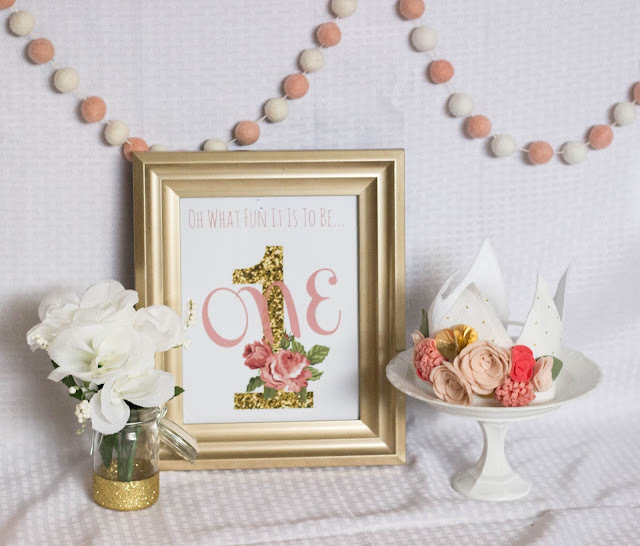 Rustic Daisy Designs supplied me with the most amazing hand made "first year" photo banner. 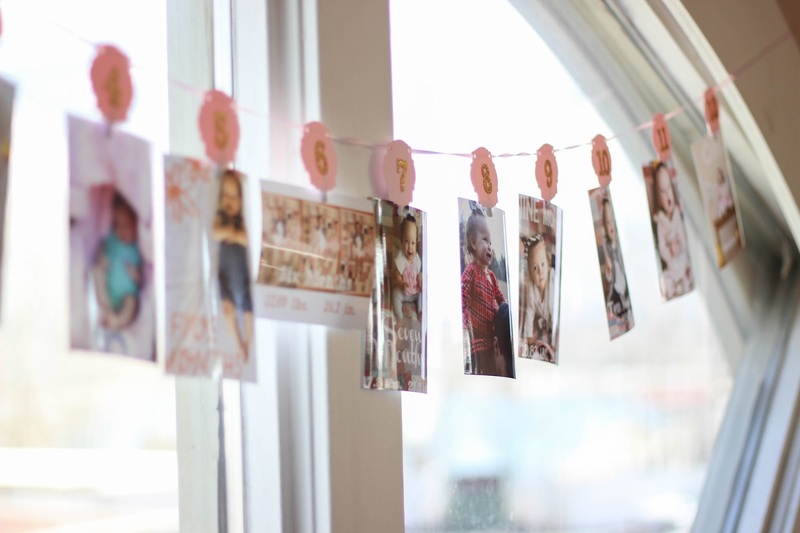 It had a number representing each month with a clothespin attached to the back to hang the picture. It was SO cute! As I hung the pictures I started to cry seeing how big she got so fast. I had a whole lot more photos I wanted to display so I took a piece of twine and folded large doilies in half over the twine. I then used clothespins to attach several more pictures to the banner. Holy cow... that was a lot! I've been so bored now that this party is over. It took over my life for several months! It was a whole lot of work but so entirely worth it to me! 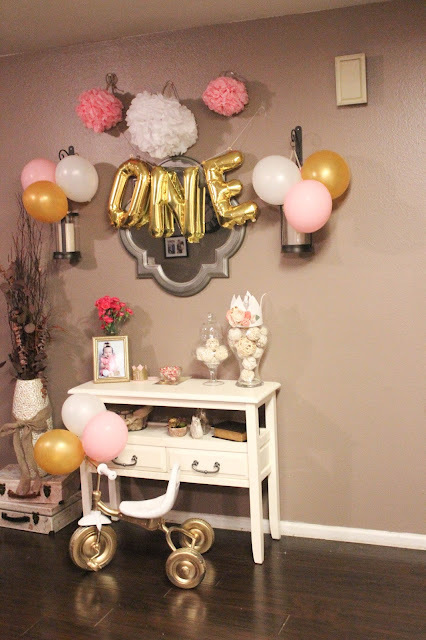 I got a ton of questions about where I purchased things, how it all came together, etc.. so I sure hope this helped and you all enjoyed this compilation of what I did to throw her party! 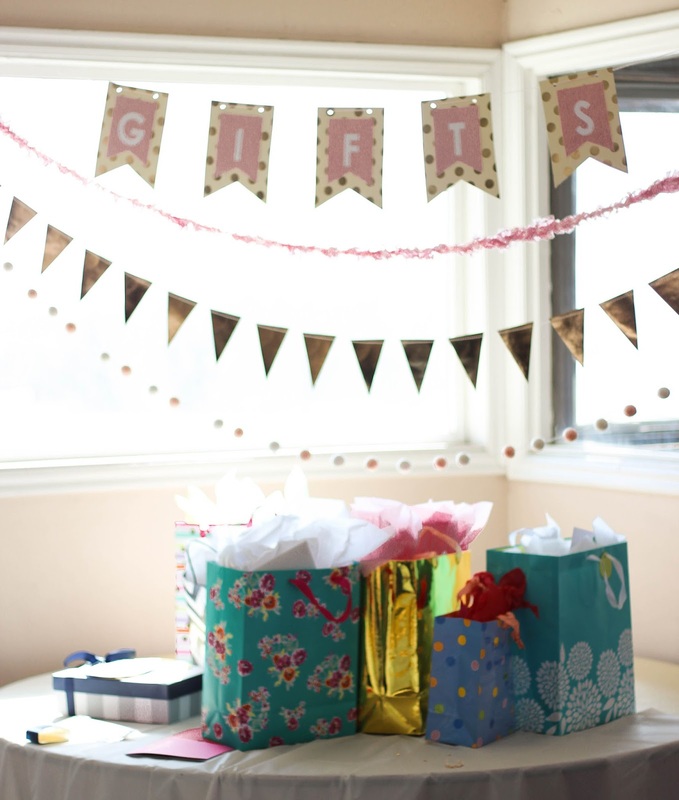 What are your favorite party decorating tips and tricks and places to shop? 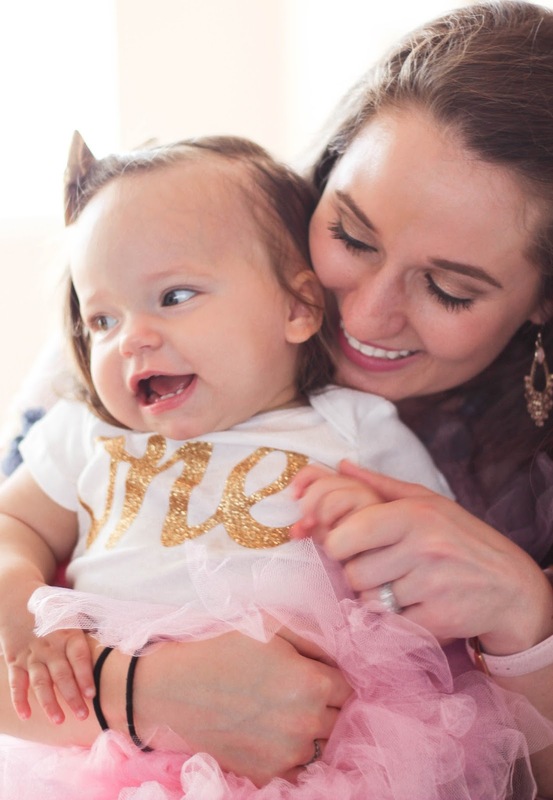 Oaklyn's First Year from Aleigh Mellinger on Vimeo. It's absolutely adorable! You did an amazing job! 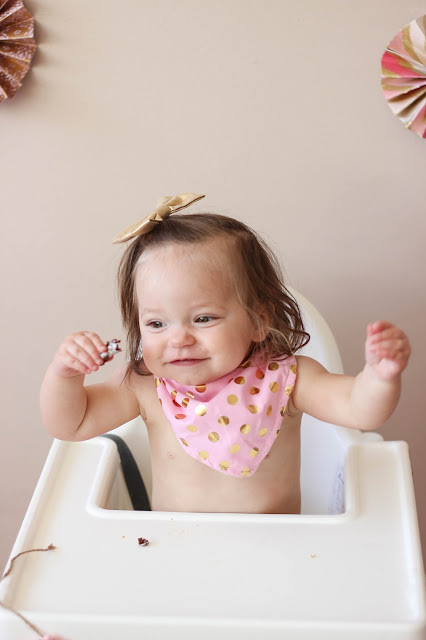 Happy birthday sweet Oaklyn - and mama you are going to LOVE the 12-18 month age, it's like the golden age of babies, so much fun! You did an AMAZING job! Everything looks beautiful! Your party is so stunning! What a lucky little lady, I can tell you put so much time into the planning and the execution. Looks amazing lady! !